For the love of life: JustRite Papercrafts October Release Day 2! JustRite Papercrafts October Release Day 2! Good morning, welcome to day 2 of JustRite Papercrafts October Release! Glad you joined us! Before I share about my project, I wanted to bring something very important to your attention. If you haven't seen the blog post yesterday on JustRite Papercrafts blog post, you should really check it out. My sweet design team mate, Darsie Bruno had fire in her home and our crafting community is getting together to embrace her with kindness and helping her with donations. Again, if you haven't seen the blog post, please check it out. My heart goes out to Darsie as I can only imagine what she must be going through during these hard times. We sure hope you can help, even if a little, it all helps! Now, let me share about my project. 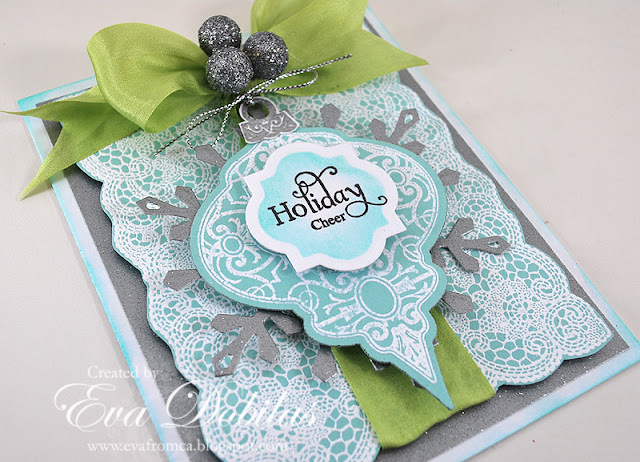 Today's card is created with a brand new stamp set called Holiday Cheer Ornament and I also used Lace Background Stamp in my background. I love the way this card turned out, and it was pretty easy to achieve it. I white embossed my images on card stock and layered them onto silver glitter card stock. My pretty bow is by May Arts from the Stamp Simply Ribbon store. The pretty silver balls are from a local craft store. I also used a few Spellbinders dies on my card. The new stamp I used coordinates with 2010 Heirloom Ornaments dies, their 2010 Snowflake Pendants dies and the JustRite Antique Tags One Dies. And here is another angle of my card. And here is what Holiday Cheer Ornaments set looks like. Isn't this a gorgeous set?? ?